Following a talk last summer by the Relief Society President of the Newcastle Emlyn ward, President Amy Wilcox gave a lesson focussed on the talk ‘I Was A Stranger’ by Linda K. Burton, the Relief Society General President (General Conference April 2016). During that lesson the sisters were invited to set a goal of knitting at least 50 items that would be useful to the refugees in Syria e.g. scarves, hats etc. The Spirit that day was strong and the sisters willingly agreed to accept the challenge to help those in need. For the next five months, the Sisters made time in their busy lives and knitted. The Young Women were encouraged to join in and set one activity a month to spend time with the Sisters to learn to knit. Some Sisters together with Primary children met one afternoon a month to come together and knit either using modern looms or the more the traditional way with needles. The time spent knitting helped the Sisters to relax, to feel the Spirit, and let the love of the Saviour be shown through them in practical ways. 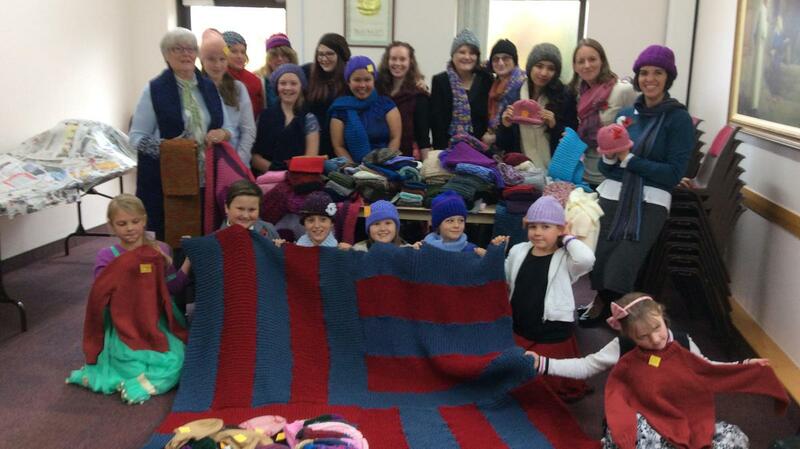 By the deadline of November the Sisters and young people had knitted together a total of 177 scarves, hats, blankets and jumpers. Not only had the Sisters exceeded their goal, provided service to those in need but had also increased the temporal self-reliance of their families. Surely it can be said of the Women of Newcastle Emlyn that they did an ‘extraordinary thing’ (Emma Smith, Nauvoo, 1842).